High sensitive trilinear CCD sensor. 2k up to 7.3k pixel line length. Max. line rates up to 156 kHz. True RGB pixel at excellent signal-to-noise ratio. CameraLink Inteface (Full, Medium, Base). 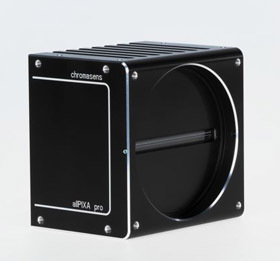 Chromasens developed the world’s fastest trilinear CCD color line scan camera combining the outstanding image quality of CCD sensors with extremely high line rates. The variety in line length up to 3 x 7300px and a maximum speed of a previously unattainable 156kHz provides a maximum in flexibility for virtually any application. In addition, the trilinear CCD technology provides outstanding color fidelity for the absolute best image quality. The end result is a world-class camera that offers a versatile set of functionalities and features that will exceed your expectations. allPIXA pro series adds additional features and performance to allPIXA series.